Normally, People for the Ethical Treatment of Animals (PETA) — the latest entrant to the drone market — takes every media hit it can performing stunts to oppose the killing of animals. Whether for clothing, eating, or curing AIDS, you can be sure PETA “lettuce ladies” will be out in force trying to stop the use of animals. However, when it comes to homeless pets, PETA doesn’t mind the killing of animals; in fact, PETA itself kills dogs and cats wholesale. State regulatory filings show that PETA has killed just shy of 30,000 pets since 1998. PETA’s stance isn’t new: PETA wrote to a Florida newspaper that reducing shelter killing was foolish and only a “no-birth” pet community was acceptable. PETA argued feverishly against a proposed ordinance in its hometown of Norfolk, Virginia that would reduce euthanasia at the city pound. So why might PETA be so vested in pet killing? The world’s most ridiculous animal liberation organization claims mercy as its motive, but there’s plenty of evidence that that’s simply a cover story. In addition to the North Carolina evidence, a recent report from Britain suggests that there is dissent within PETA over the puppy-killing program’s appropriateness. Also, other supposedly “death’s door” pets picked up in PETA’s backyard but sent to other shelters are living and thriving, no thanks to PETA’s syringe. 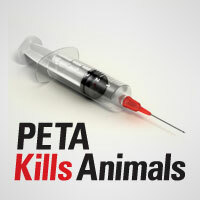 But to PETA, animals living and thriving in human care might actually be a fate worse than death. An attorney representing PETA argued as much in open court about elephants being brought to zoos. PETA President Ingrid Newkirk has said that in her vegan utopia pets “would be phased out.” Whether it is PETA’s intent or not, PETA’s animal shelter is keeping up its part of that desired phase-out.